I loved reading about your stinky tofu experience. If I remember right, that is the first food Andrew Zimmerman could NOT (or would not) eat. I'm proud of you too. However, I do not plan to try that when I visit. I like that the restaurant serves the food when it is ready. That is how my dinner was served last night as we misjudged when the barbeque would be ready compared to the potatoes, bread and veggie! Love you lots and love reading your blog! What is it that actually makes the tofu stink? I'm intrigued, and slightly disgusted. great story!!! I'm kind of grossed out by this tofu business though! you haven't found the right gas station yet. there are some that are full service that if you fill a full tank, you get a case of bottled water. 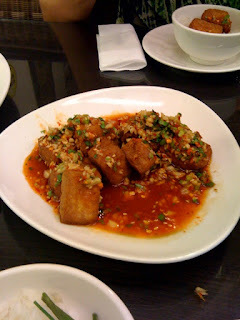 stinky tofu is suppose....supose,i repeat to taste good, but just don't smell it, it's pretty bad. lol i couldn't stop laughing about the stinky tofu. you need to try the stinky tofu in those big round vats on the street. the smell makes me want to vom. :) i'll say hi to america for you. enjoy taiwan! 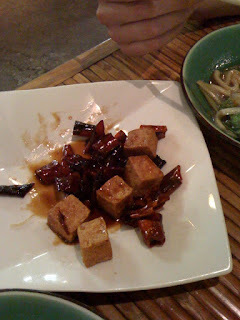 I just want to clarify the part that Jeremiah posted about ordering the stinky tofu. The man was talking about the tofu being spicy - he actually said in English "spicy" then waved his hand in front of his nose like it would clear your sinuses (like wasabi). I was sitting right next to him and he did not make an ugly face. I thought that maybe he was just not as good at charades as Jeremiah is. AND Jeremiah failed to recount how after he ate his reheated leftovers he blew his stinky breath in my face - super yuck! Overall I'm glad we had it, though I won't be ordering it on purpose any time soon.